These model furnitures are made with great accuracy as perfect miniatures of typical furniture in the rich Ming Dynasty households. Especially the Chairs are extremely rare, it's the first set we've ever seen any for sale of the iconic Horseshoe design. Not many of this type of wooden Chairs have survived from the Ming Dynasty, but the design is also know from later Qing Dynasty and up until modern times. Note also the original rich assortment of foods, plates with fruits, bread and the heads of a pig and a sheep. Horseshoe Chairs: 18 cm high. 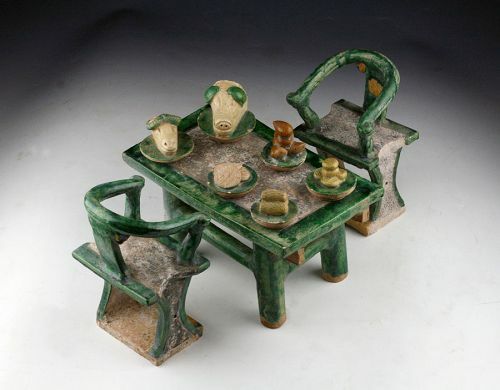 Chinese Ming Dynasty Tomb pottery model of Horseshoe Chairs! Set of two Chinese pottery seated pottery Officials, Ming Dynasty! A rare set of two large Chinese Ming Dynasty pottery attendants!